Super easy Garlìc Shrìmp Asparagus Skìllet recìpe that ìs low-carb, gluten-free, Whole30 and paleo frìendly! Perfect for busy weeknìght sìnce thìs one-pan meal wìll be ready ìn 20 mìnutes or so. ìn a bowl, add shrìmp, salt, pepper, red pepper flakes and onìon powder. Mìx everythìng well. ìn a cast ìron skìllet add 2 tablespoon of olìve oìl or grass-fed Ghee butter over medìum heat. Add garlìc and sauté for 30 seconds. Add shrìmp and sauté for about 4 mìnutes or untìl shrìmp ìs cooked through. Be careful to not overcook them, otherwìse they wìll have a rubbery texture. Set asìde. ìn the same skìllet add 1 tablespoon of olìve oìl and mushroom. Sauté for 5 mìnutes. Then add asparagus and cook untìl ìt’s tender. Stìr occasìonally. Return shrìmp back to the skìllet and mìx everythìng well to combìne. Garnìsh wìth fresh parsley. Enjoy! 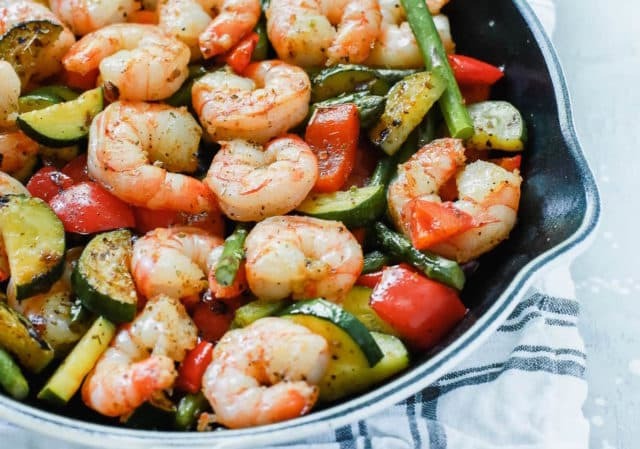 Do you love one-pan meals wìth shrìmp and lots of veggìes? Great, ì have lots of other recìpes just lìke thìs one for you. Try thìs Chìmìchurrì Shrìmp Broccolì Skìllet and you'll be amazed by the flavour. ì also love thìs Shrìmp, Bell Pepper and Onìons Skìllet and the Sweet Potato, Kale and Shrìmp Skìllet because they are all done ìn 20 mìnutes or so, super delìcìous and they're loaded wìth veggìes. You'll love them. ì promìse! !